In the Transactions area of REST, you can view and track your commissions on your current business. 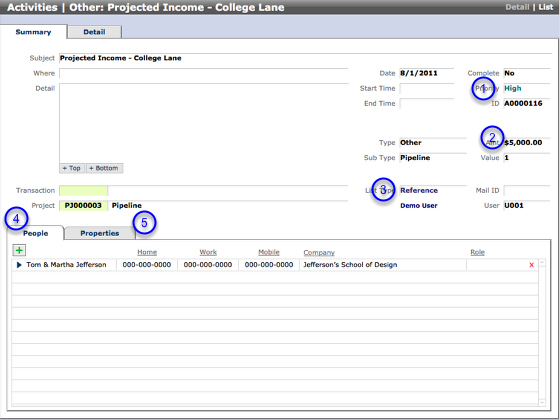 Sometimes, however, you may want to track projected income in earlier stages, before setting up a new Transaction. Examples might include REO business 'pre-listings', expected listings and early-stage Buyer agency. An easy way to this, is by using the Projects and Activities Areas. Be sure to add a Purpose and Describe Intended Successful Outcome. From the Activities tab, click the Green plus button. 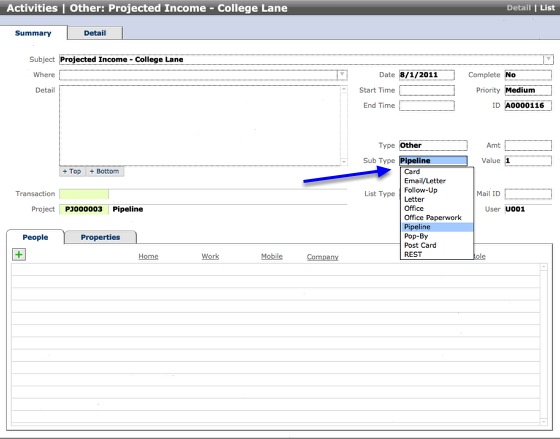 Enter Subject: Use a naming convention that allows for easy finds, looks cleaner in lists and printed reports. 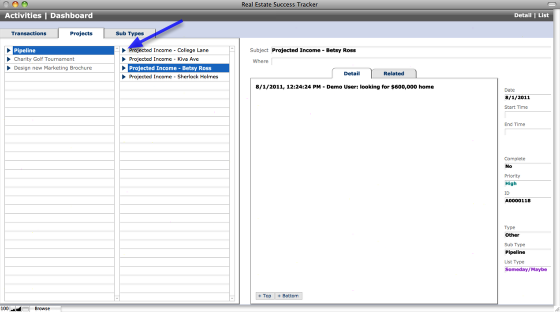 The example shows the subject followed by "space dash space" followed by property street name. In the dialog, click the Options button to create your new Activity and navigate to the Detail View in the Activities area. 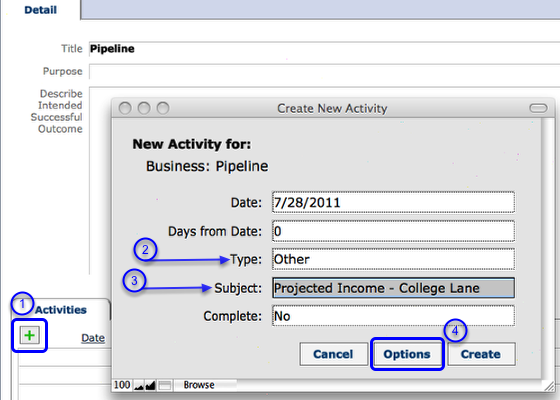 Note: this is an auto-generating drop down and 'Pipeline' is automatically added. 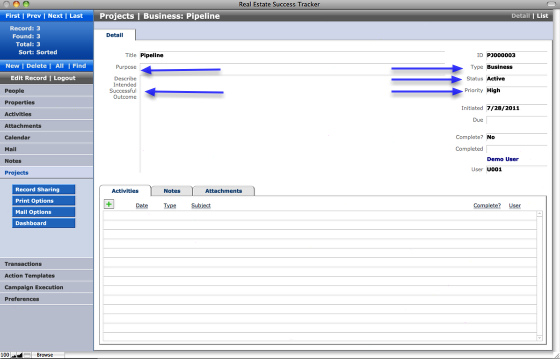 Pipeline records can be added from either the Activities area or the Projects area. Create a new Activity in the Activities area. 7. 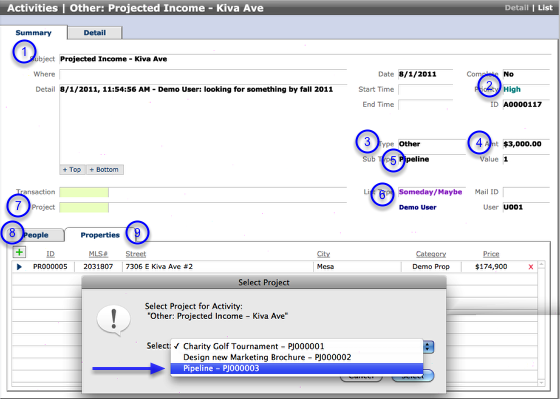 Click the Project button (item 7 in the screenshot) and select a Project from the dialog (shows only active projects). Extra: if you've got a large monitor, you might find it helpful to keep the Dashboard open in a seperate window while you work in other areas of REST. The Dashboard view has tabs showing open Transactions, active Projects and Sub Type filters for immediate access to everything that's "on your radar". While the REST Calendar gives traditional time-based views, the Dashboard provides focus on everything else. Click the Blue arrow button to navigate to the Detail View for an item. Hold down the Alt (Win) or Option (Mac) key and click the Blue arrow button to navigate to the list of items. Results are calculated from the found set.